As noted with the three preceding SAS vehicle (Jeep) kits, Lieutenant Colonel David Sterling is one of the legendary figures to arise from British operations in North Africa and his Special Air Service (SAS) forces were long noted for their long range operations. One of the iconic photos of those operations has him standing next to a patrol led by a Lieutenant McDonald in a modified Willys MB jeep. As before, note that once again because of the Chrysler Corporation demand for royalties for using the name “Jeep” this kit cannot call it that. While these are raider jeep crews, they are simply called “SAS Vehicle Crews” for that reason. This kit provides a figure of Stirling and six “mix and match” figures which basically replicate those that come in each of the previous jeep kits. 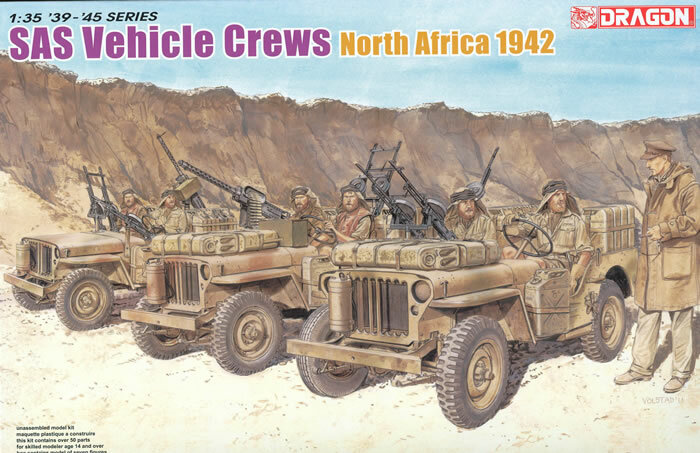 While this may disappoint some, anyone who wants to either provide a crew to a Tamiya LRDG Chevy truck or other desert vehicle, or any other company’s jeep or SAS vehicle conversion, can now pick them up for a very reasonable price. Each figure comes in eight parts: head, torso, arms, legs and a two piece “burnoose” headgear with a separate skirt and crown. Stirling comes in seven parts with a one-piece toggle coat and head, cap, arms and legs. No painting instructions are included which is a bit of shame, as the figures deserve better treatment by DML. The box art has to suffice – and with this kit DML has managed to get at least three box art paintings out of one Ron Volstad original! All of them look the part and match up well with photos, but the navy-style duffle coat on Stirling appears to be about 3" shorter than those in the photos and the box art. In those it comes down to the center of his knees and here it is just above the knee. Overall while this may not help out anyone with the kits - getting six repeat figures just to get the Stirling figure is a bit expensive - they do provide good quality figures for any other combination of desert vehicles used by the SAS.